In order to make the installation of your equipment smooth Dometek requires that your utilities, power sources, air requirements, vacuum needs and all peripheral equipment meet certain specifications and be ready/available when our engineering team arrives for installation. All peripheral equipment not included in the Sales Contract should be ready for integration. 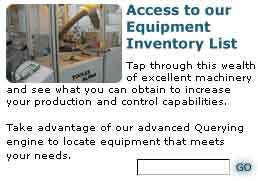 For experienced customers and new ones we are happy to explain what is needed for ancillary machinery. As electrical power may differ from country to country even from area to area of a country we are careful to spell out in our Sales Contract the power requirements necessary to safely and effectively operate the equipment. It is extremely important that all issues related to utilities for the equipment purchased from Dometek, or for that matter, any vendor be completely and totally understood and explained. This is not only for smooth operation and successful production but also for the complete safety of the operators and maintenance staff.